In this Dec. 11, 2016, file photo, Colin Kaepernick of the San Francisco 49ers kneels on the sideline, during the anthem, prior to the game against the New York Jets at Levi Stadium in Santa Clara, California. 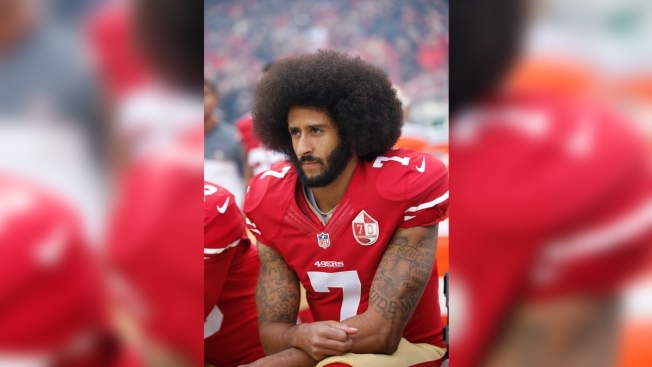 Former San Francisco 49ers quarterback Colin Kaepernick again is at the center of controversy and it has led to an apology from Redwood City-based EA Sports. In the company's new Madden NFL 19, EA Sports edited a song by rapper YG featured in the game's soundtrack. Big Sean is featured in the song, and a line in his verse names the former National Football League player, but EA Sports removed the reference. Nicki Minaj and 2Chainz are also featured in the song. YG responded on Instagram Thursday, saying that none of the artists approved of Kaepernick's name being removed. Big Sean in a tweet Thursday also accused the company and the NFL of censoring the song. EA Sports late Thursday apologized, saying it accidentally edited the song because they do not have rights to include Kaepernick's likeness in the game. The company said the unedited song will appear in the game through an update. Kaepernick ignited a national movement in 2016 after refusing to stand during the national anthem before NFL games.